PURPOSE: International and national research regarding the discussion of cancer treatment across cultural boundaries is sparse. This study was conducted in the province of KwaZulu-Natal, South Africa, where healthcare encounters are largely culturally discordant; and this study focused on adult Zulu patients diagnosed with osteosarcoma. The purpose of this research study was to identify the cultural factors associated with discussing the different treatment options - and to explore healthcare professionals' responses to these cultural factors - from the healthcare professionals' perspective. METHODS: A qualitative, exploratory, descriptive and contextual research design was used. We conducted focus group interviews with professional nurses, allied health professionals and orthopaedic physicians. These three focus groups comprised a total of 23 participants, and interviews were conducted with each of these groups. We thematically analysed the interview transcripts, using Guba's model of trustworthiness to ensure rigour. We identified strategies for responding to the cultural factors associated with amputation, namely timing treatment discussions, using support services, patient models and DVDs or videos. Strategies for responding to cultural and health beliefs that affect the treatment included initiating the cultural discussion, demonstrating an understanding of patients' cultural beliefs and liaising with family and cultural decision-makers wherever possible. CONCLUSION: Our findings emphasised healthcare professionals' reports of how patients can experience the discussion of culturally discordant treatment options as bad news. We recommend that the treatment discussion form an integral part of the guidelines for culturally competent communication with such cancer patients. An extensive literature exists on communicating the diagnosis and prognosis of cancer to patients (Figg et al. 2010; Girgis & Sanson-Fisher 2010; Hagerty et al. 2005; Monden, Gentry & Cox 2016). However, the literature on discussing treatment options tends to be limited (Baile et al. 2000; Girgis & Sanson-Fisher 2010). Research, regarding the discussion of treatment options across cultural boundaries, is especially sparse. Although informing patients of their treatment options and ensuring their understanding in this regard is considered good practice (Girgis & Sanson-Fisher 2010). Patients tend to be less satisfied with discussions regarding treatments when compared with those in which the diagnosis only is communicated (Galletari et al. 2002). This study was conducted at a public tertiary hospital in a unit dedicated to the treatment of musculoskeletal tumours in the predominantly rural province of KwaZulu-Natal, South Africa. At this facility, healthcare encounters are largely culturally discordant. The study focused on adult Zulu patients diagnosed with osteosarcoma. Osteosarcoma is the most common primary bone cancer (Ritter & Bielack 2010) and the complexity of its treatment necessitates a multidisciplinary team (MDT), approach. This context and the disease type were chosen, because previous research at our study site reported that the majority of patients present with locally advanced or metastatic disease (Ferreira & Marais 2012). This limits the treatment options and it usually results in a very poor prognosis (Errani et al. 2011; Ferreira & Marais 2012; Marais et al. 2015; Meazza & Scanagatta 2016; Ritter & Bielack 2010). Although there has been a significant shift with regard to surgical treatment options, away from amputation to limb salvaging (around 80% of patients) (Bielack et al. 2009; Jaffe 2009), a substantial proportion of patients, presenting at the study site, are not candidates for limb salvaging because of the advanced stage of the disease at presentation (Ferreira & Marais 2012). 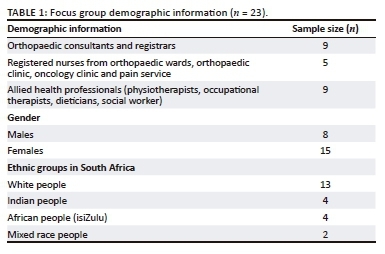 Granted that this late presentation is partly a result of misdiagnosis at community health centres or district hospitals (Ferreira & Marais 2012), nevertheless observations in clinical practices indicate that Zulu patients often prefer to exhaust all the traditional healing options before seeking Western medical assistance. Zulu patients typically engage in cultural health beliefs and practices that are in contrast to the Western medical model, within which medical training is housed. They may conceive illness as resulting from displeasing the ancestors, witchcraft or troublesome social relationships (Mdondolo, De Villiers & Ehlers 2003; Vorobiof, Sitas & Vorobiof 2001). The purpose of this research study therefore was to identify the cultural factors associated with discussing treatment options - and to explore the healthcare professionals' (HCPs) responses to these cultural factors - from the HCPs' perspective. This research forms part of a larger research project and, although this article focuses on HCPs' perspectives, patient interviews were also conducted and will be reported on in a separate publication. We used a qualitative, exploratory, descriptive and contextual approach, and we conducted focus group interviews with three distinct groups of professionals: professional nurses, allied health professionals and orthopaedic physicians (including consultants and registrars). The focus group interview schedule was piloted with a social-work colleague who has experience with working with cancer patients in the study setting. The interview questions focused on approaches that HCPs take when discussing the treatment of osteosarcoma with Zulu patients and the cultural considerations pertaining to this discussion as well as their responses to these cultural factors. We recruited the participants, using census sampling. All 23 study participants were members of the MDT involved with the care of Zulu patients with osteosarcoma. The MDT at the study site comprised orthopaedic consultants and registrars, professional nurses from the orthopaedic and oncology outpatient clinics and wards, allied health professionals including dieticians, occupational therapists, physiotherapists, social workers and clinical psychologists. Five team members could not participate because of scheduling conflicts. Only four of the participants were isiZulu speaking, highlighting the culturally discordant medical encounters at this health facility. For the purposes of describing the sample and contextualising the findings, the demographic details of the sample are outlined in Table 1. The second author, an experienced qualitative interviewer, conducted the focus groups, because she had no prior knowledge of the participants. The focus group interviews were conducted at the hospital, as the participants work in a resource-constrained environment, and the interviews ranged in duration from 54 to 95 min. Because of scheduling conflicts, the distinctive groups of professionals (orthopaedic physicians, nurses and allied health professionals) were interviewed separately. All the interviews were audiotaped, transcribed verbatim and analysed for themes (Braun & Clarke 2006). The data were independently coded by the focus group interviewer and the primary investigator. They were further reviewed by two qualitative research experts before consensus was reached on the themes. Guba's model of trustworthiness (Lincoln & Guba 1985) was used to ensure rigour. With regard to the criterion of credibility, research methods, which are well-established in the qualitative genre, were used. The researchers were suitably qualified, and they had the relevant experience required for the research project. Data verification entailed the processes of independent coding by the second author, two rounds of peer review of the themes by two independent qualitative researchers, and a final theme discussion by the principal investigator and the second author. Contextual credibility was addressed, because the principal investigator had in-depth knowledge of the participating organisation. This ensured that the focus group interviewer had a good understanding of the approach taken in the management of osteosarcoma patients at the study site. The focus group interviewer employed iterative questioning and probing to elicit rich data and verify the information. Guba's transferability and dependability were addressed by providing a detailed description of the research context and the research procedures followed so that readers would be able to decide on the transferability of the findings for their context - and also to facilitate any future repetition of the research project. Dependability was further addressed by providing an operational description of the research design and methods as well as a reflexive appraisal of the research undertaken. The confirmability criterion relates to ensuring that the findings reflected the experiences and opinions of the participants, rather than those of the researcher (Shenton 2004). As the principal investigator works at the study site, an experienced independent researcher, who had had no prior contact with the participants, conducted the focus groups. The process of bracketing was used while analysing the data (Tufford & Newman 2010), and the themes were verified by independent qualitative researchers. Anonymity was ensured, as the focus group interviewer had not had any prior contact with the participants. The purpose, objectives and significance of the study were explained to the participants before consent was obtained and these aspects were also outlined in written form. Voluntary participation, the right to withdraw from the study, confidentiality and informed consent therefore were applied. Ethical clearance to conduct the study was obtained from the Biomedical Research Ethics Committee at the University of KwaZulu-Natal. Consent was obtained from Health Research and Knowledge Management of the Department of Health KwaZulu-Natal, following which gatekeeper consent was obtained from the CEO of the tertiary hospital where the research was conducted. The results highlight two significant themes pertaining to the focus of the article. The first theme addressed the cultural factors associated with the treatment discussion, while the second theme focused on the strategies used to respond to these factors. Importantly, the focus group process was transformative (De Laine 2000), as it allowed for the Zulu HCPs to educate other participants about Zulu cultural beliefs and practices. This enhanced the awareness of cultural factors to be considered when communicating with Zulu patients. The participants reported that culture plays a significant role in the discussion of treatment. The HCPs were concerned that the cultural decision-maker might not have insight into the patient's condition and that such patients would be deserted by the cultural hierarchy if they ignored their advice and made decisions independently. The HCPs perceived that patients' willingness to share their cultural beliefs was an individual preference. Some patients withheld their desire to consult a traditional healer, while others admitted this need. There was no consensus regarding patients' disclosure preferences. Some of the patients disclosed their traditional beliefs with greater ease to Zulu HCPs, whereas others more easily disclosed these beliefs to non-Zulu caretakers when prompted. Strategies for responding to the cultural factors associated with amputation and patients' cultural and health beliefs emerged from the data. Timing the treatment discussion was viewed as a means of preventing the patient from signing a refusal of hospital treatment before diagnostic testing was complete. The HCPs emphasised the importance of not answering any questions regarding treatment options for osteosarcoma before the diagnosis had been confirmed. The participants tended to respond to the refusal of amputation by (1) offering the patients other treatment options like chemotherapy; (2) facilitating follow-up with oncology and other services like psychology, social work and dietetics; and (3) mobilising support by including the psychologist in diagnosis and treatment discussions wherever possible. The participants reported needing to balance cultural sensitivity with the urgency for prompt treatment. HCPs accepted their onus to initiate discussions on cultural requirements in order to fast-track the decision-making process. The participants proposed specific strategies for culturally competent communication. They reiterated not making assumptions based on culture and race, but they proposed taking responsibility for learning about the Zulu culture and suggested including traditional healers in the regimen for patient care. The HCPs in this study demonstrated considerable knowledge of Zulu cultural beliefs and practices - a characteristic deemed essential for working in cross-cultural clinical settings (Mullin, Cooper & Eremenco 1998; Pierce 1997; Tucker et al. 2013). They emphasised taking responsibility for learning to know the Zulu culture (Matthews-Juarez & Juarez 2011; Muñoz-Antonia 2014; Pesquera, Yoder & Lynk 2008). Cultural aspects reported on included the belief of having to remain intact to become an ancestor after death, the fear of being excluded from the community post-amputation, the belief in traditional healing as a means of cure, and the role of the cultural hierarchy in decision-making. The HCPs also reflected on patients' disclosure preferences and patients' hesitation to disclose their cultural beliefs - given their perception that Western HCPs may obstruct their desire to observe their traditions (Davis, Oh, Butow, Mullan & Clarke 2012; Robinson & McGrail 2004; Shelley et al. 2009). The HCPs reported on patients' cultural beliefs regarding amputation. Proposed strategies for responding to Zulu patients' responses to amputation included timing the treatment discussion and using patient models - or videos of patients who have successfully rehabilitated after amputation - as a means of easing patients' anxieties and facilitating decision-making (Baile & Beale 2001; Krouse 2001; Schofield et al. 2008). The participants ensured that the patients received care - whether or not they chose amputation. If the patients refused amputation, the HCPs offered other treatment options, facilitated follow-up from oncology and allied health professionals and mobilised support by including the psychologist in diagnosis and treatment discussions where possible (Baile & Beale 2001; Girgis & Sanson-Fisher 2010). The participants reported on patients' belief in traditional healing. Strategies for responding to this cultural factor included encouraging patients to engage in their traditions, demonstrating respect for patients' preference to consult traditional healers and proposing that patients combine traditional and Western medicine (Broome & Broome 2007). Those patients with traditional belief systems associate consulting a traditional healer with hoping for a cure and receiving spiritual and physical profit from the consultation (Muhamad, Merriam & Suhami 2012). The participants were concerned about the paradigm divide on the hope of a miracle cure from traditional healers versus the Western medical message of no cure (Summerton 2006). Research has shown that patients from indigenous populations, especially when diagnosed with a life-threatening illness such as cancer, may integrate Western medicine and traditional healing (Broome & Broome 2007; Muhamad et al. 2012; Struthers & Eschiti 2004). However, our study highlighted a concern that patients might neglect Western medicine when they returned home to engage in their traditions. It was also the HCPs' experience that patients tended to delay returning to the hospital or avoided medical treatment completely. Proposed strategies for fast-tracking treatment decision-making included initiating cultural discussions, liaising directly with the cultural decision-makers regarding treatment (Barclay, Blackhall & Tulsky 2007; Broome & Broome 2007) and suggesting that family members come to the hospital rather than the patients going home. Most patients, using alternatives to Western medicine, may have had an expectation of the clinician to initiate the discussion regarding these practices (Shelley et al. 2009). Furthermore, given the fact that the Zulu culture is located in a collectivistic paradigm where patients tend to defer to the collective for decision-making (Iwelunmor, Newsome & Airhihenbuwa 2014), liaising directly with cultural decision-makers might fast-track the treatment. Despite HCPs' proposing that the patients invite family members to come to the hospital, patients generally insisted on returning home. The participants then tended to give the patients a deadline for returning and they warned them that traditional healing might not necessarily be effective. They reminded the patients that the ultimate decision was theirs, and they ensured that the patients were well-informed about their condition. These strategies denote a paternalistic, individualistic approach and demonstrate limitations regarding veritable understanding of the patients' cultural paradigms. Patients who have cultural health beliefs, embedded in traditional healing, believe in the curative capacity of traditional medicine (Muhamad et al. 2012). Similarly, reinforcing individualism regarding decision-making negates the collectivistic paradigm within which Zulu patients operate (Washington 2010). Although HCPs might be well-intentioned and focused on life-saving, strategies used for patients who insist on going home are not indigenously collaborative and, consequently, they favour Western approaches to medical decision-making. The HCPs in this study demonstrated a willingness to engage collaboratively and cross-culturally. An awareness of the use of paternalistic strategies in response to patients who insist on going home would therefore assist HCPs to change this approach. Although themes were repeated within the focus groups, all the members of the MDT were not available for the data collection and this may have limited our ability to achieve data saturation. Furthermore, our use of discipline with specific focus groups may have limited our opportunity to assess the inter-professional functioning of MDT members. We also note that the use of other qualitative data-gathering techniques may have complemented the focus groups and enhanced our data. This study, the first of its kind in the South African context, explored the cultural factors associated with discussing treatment options and identified strategies for responding to these factors. The cultural factors highlighted included patients' beliefs about amputation, their need to access traditional healing and their requirements regarding collective treatment decision-making. The participants highlighted the importance of balancing respect for patients' cultural preferences with the need to expedite treatment decision-making in order to improve the prognostic outcomes. Their proposed strategies for responding to patients' aversive responses to amputation, entailed timing the treatment discussion, using patient models and visual media to ease patients' anxieties, referring patients appropriately and mobilising support. Strategies for attending to cultural and health beliefs impacting treatment decision-making included initiating the cultural discussion, seeking and demonstrating an understanding of patients' cultural beliefs, liaising directly with the family and cultural decision-makers, learning about the patient's culture and working collaboratively with traditional healers. While the participants reported significant efforts to provide culturally competent care, medical paternalism emerged in response to patients who insisted on going home to engage in their traditions. The strategies that we present will be useful in other cross-clinical settings where patients belong to collectivistic cultures and observe traditions and other practices that are significantly different from Western medical approaches. We recommend that guidelines for culturally competent communication with cancer patients should explicitly discuss the issues of managing culturally discordant treatment options. This study will contribute to the development of a guideline that would achieve this goal. The authors thank the participants for their participation in the study, Dr Wilma ten Ham-Baloyi and Mr. Kegan Topper for reviewing the qualitative data and Prof. William Ventres for commenting on the manuscript. O.B., D.R.M.v.R., C.A. and L.C.M. made substantial contributions to the conception and design of the work. O.B. and V.G. were responsible for the acquisition, analysis and interpretation of data. O.B. was responsible for drafting the work, and all authors were involved in the final approval of the version submitted to the journal.